Rachmaninov's two great contributions to the Russian Orthodox choral tradition more then justify their continual reappearance on disc. The regular appearance of recordings of both works, and the Vespers in particular, suggests that sales figures remain healthy. Perhaps the two works are benefiting from the popularity of more recent eastern minimalist composers. 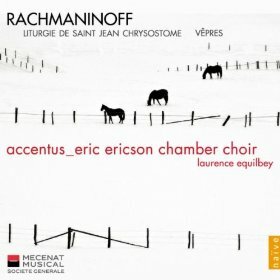 If you have come to eastern liturgical music via Pärt or even Shchedrin, the chances are you're going to find Rachmaninov's music considerably more substantial. In fact, the music is paradoxically sophisticated, Rachmaninov limits himself to a small set of harmonic and contrapuntal devices, yet the soundworld is often almost as sophisticated as in his symphonies. It is music that repays repeated listening, and also hearing in different recordings. The performing traditions of the Eastern Orthodox Church go back a long way and can be very difficult to untangle from a Western perspective. Curiously, there are very few recordings of this music from Russia, so most on the market present a more subjective approach from Western performers. They are singing for Western audiences too, which provides a certain justification for sidestepping issues of authenticity. And perhaps that isn't such a bad thing. If you hear choral music in a Russian church it tends to by sung very legato, with dynamics only used to create contrasts between phrases, and the sound enveloped by an obscuringly resonant acoustic. This performance is at the other end of the spectrum. Two choirs have been combined, but the forces are still small. The recording environment is a church, but Catholic rather than Orthodox and with a warm but clean and unobtrusive ambience. Most significantly, the style of performance is quite straight: there is little in the way of sliding portamento and phrases are shaped using dynamics and even at times some limited rubato. Some may complain that the sound is a little top heavy, but the choir has at least one basso who is as profundo as the music requires. Tuning and ensemble are excellent throughout, which given the technical competency and stamina that this music requires is quite an achievement. But why only excerpts? Both works fit individually onto a CD, so why not issue them complete as two CDs. In the Liturgy of St John Chrysostom, it is the quieter movements and the solos that are omitted. For casual listeners (myself included) the larger choruses are the more satisfying musically, so the choice of movements is reasonable. And solo voices are used extensively in the excerpts from the Vespers, so the programme retains its variety. The sound quality is good, and even though the choir is small, individual voices never stand out. The overall effect is of a very proficient reading, slightly buttoned down perhaps but never dispassionate. Many recordings strive for excess in this music, and that has its place, but this more refined interpretation is also very approachable. It might not have the raw passion of a Russian liturgical choir, but the combination of professionalism and commitment still makes for spiritually and musically rich experience.